Cardinals in Winter Puzzle is a 1000 piece puzzle. This puzzle has your favorite Northern Cardinals in a landscape winter setting, perch above the snow among the winterberries. 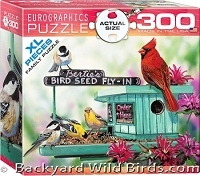 Attractive wild bird puzzle with Northern Cardinals is great fun to put together. Eco-friendly made from recycled board and printed with vegetable based ink. 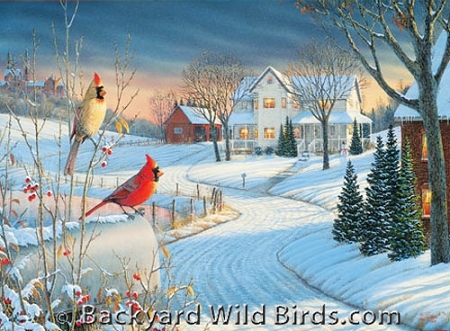 The Snow covered winter scene is bursting with color in this beautiful painting by artist Sam Timm. With their bright colors and happy songs, these beautiful scenes evoke feelings of peace and tranquility. Strong high quality, larger puzzle. This superior quality puzzle will delight and educate all at the same time. Finished size is 26.5" x 19.25".